All Pikes Peak Reads has chosen this year’s library recommendation: ZORRO! Did you know that was a work of literature? Dumas, you think? R.L.S.? This choice follows To Kill a Mockingbird, Frankenstein, Treasure Island, and Alice in Wonderland. All accessible to younger readers to be sure, and literary to boot. I have no argument with Isabel Allende’s Zorro [prequel], to entice the participation of Pikes Peak area adults, but what for the children? Charles Lamb? Harold Lamb? Did Zorro capture their prolific imagination? No, the kids get to read not the Legend of Zorro, but ABOUT the legend of Zorro. Great, so it’s not literature, at least it’s history. Is it? 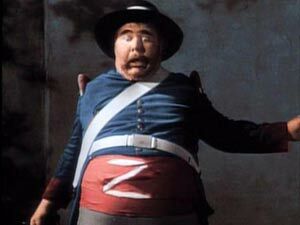 It turns out Zorro sprung from a post-WWI pulp serial The Curse of Capistrano written by screenwriter Johnston McCulley. The black mask and cape were added by Douglas Fairbanks in his 1920 portrayal, and the rest is [film] history. So Zorro is Tinseltown legend, and the historical setting inverts itself from there. The Hispanic colonial rule of California against which Zorro rebelled never existed in that too-rural territory. But it sure creates a convenient boogey man from which the United States can feel better liberating the early Californians. Zorro, in Spanish “The Fox” being the surrogate advance scout, extending justice over the objections of the despicable Spaniards until the cavalry can arrive. The adventure published on the heels of US belligerent fight-picking with Mexico. So much for history. A Zorro legend lacks even for historical precursors. Robin Hood might be the closest example, except according to legend, Robin Hood was a man of the people, not a rich man robbing for the poor. Zorro’s Don Diego follows more the Alexander Dumas model of The Count of Monte Cristo, avenging having been usurped of his noble birthright. Since the Enlightenment and the suspicions it cast on the divinity of monarchist rule, official chroniclers have been tasked to remind the masses that a “fox” could never be more cunning than his betters unless he was of uncommon blood. Noble deeds can only be expected of noblemen, hence the term. This stereotype has always trumped the Puss in Boots or Horatio Alger stories coming from steerage. The Count begat Zorro begat Batman begat the Green Hornet begat the George Soros secret funding mystique. Now we even speculate that Robin Hood, had he existed, must have been a disenfranchised noble. Likewise Jack the Ripper. Common man can’t even get credit for crime. To be clear, the oligarchs know their people won’t buy rule by divine right, but we do respect Darwin’s survival of the fittest. And certainly fitness and advantage are hereditary. Only those fit shall rule. I extend this deference of heritage to my real life heros, but is it warranted? Che Guevara was from the privileged class and is lauded by the counter-culture as the most heroic revolutionary figure of our time. But ultimately, and conveniently, a tragic failure. On the other hand, the truly effective populist reformers of modern times have all been of ordinary birth. Counting backward, Morales, Chavez, Mandela, King, Lumumba, Castro, Gandhi, Mao, Lenin, Marx. Would Zorro stand up as an Easop’s fable or does he subvert man’s self-wisdom? Gotham cannot fend off its criminal elements without super-just Richie-Rich Bruce Wayne, thankfully completely benign in his vigilante despotism and not the least bit a corrupted-absolutely Nero or perverted Gilles de Rais, donning a Blue[-blood] Beard to mask his nightly reconfiguration of injustice. Pikes Peak Reads is part of Laura Bush’s unholy surge, the library extension of the Every Child Left Behind travesty devastating our education system. Even if the choice of reading about a fictional legend was made locally, it doesn’t surprise me. The third grade of our well-regarded elementary last year followed The Legend of Sleepy Hollow with a lesser known Washington Irving legend: Batman! The former coincided with a Discovery Channel premiere of Sleepy Hallow and the latter turned up at the megaplex, it was: Holy tie-in with the H.E.W. Batman! A new beginning! I’ll eat Zorro’s hat if Isabel Allende’s precursor, Zorro, a new beginning, isn’t coming to the screen this year, or isn’t precursing a sequel, which would make it what, a cursor[y] Hollywood incarnation? Next year the Pikes Peak pick, left for the children to decide, will be the legend of another masked, caped crusader, a legendary Italian everyman, and ever too mortal, Mario of the Brothers franchise.